The City of Weatherford, Texas, had a big challenge on its hands – to nearly double the capacity of its drinking water treatment plant in a 2,700-square-foot space. Adding six MGD (22.7 million liters per day) of capacity in less than half of the facility’s 7,300-square-foot building was no small feat. The city – just 30 miles from Fort Worth – had grown from 19,000 to 26,650 in less than a decade, and was continuing to expand. Weatherford already had four packaged, high-rate settling, adsorption clarification, mixed media filtration systems installed. Two more would have only added four MGD, according to Plant Manager John Richmond, so the city tested several membrane microfiltration technologies and chose a three-rack, microfiltration (MF) membrane system capable of handling six MGD in the same footprint, which are arrayed side-by-side, with narrow walkways between them. With a compact and effective MF technology lined up, Richmond and his team set to work pretreating raw water and coordinating the two technologies. The plant draws its source water from Lake Weatherford, a 1,158-acre reservoir. A half-mile, 24-inch (61 cm) concrete line supplies the plant. After chlorine dioxide is added to the main line before treatment, the water encounters a T-intersection. Roughly half goes to the mixed media filtration and the other half is sent to the membrane side of the facility. Back flush water is collected in either of two 12,000-gallon (45,424.9 liters) decant tanks, where a small amount of polymer speeds the flocculation of captured solids. Water from the decant tanks is pumped to a settling lagoon. From there, clean water flows into a creek below the reservoir, while any remaining solids are periodically removed mechanically from the bed of the lagoon. Residual chlorine dioxide dissipates during the settling process or is eliminated by sunlight in the lagoon. With a maximum depth of just 38 feet (11.6 meters) and no settling ponds at the water treatment plant, suspended solids (algae in the summer and silt year-round) are a constant threat to the membrane system. Both types of contaminants can plug membranes, dramatically reducing their efficiency and shortening cleaning intervals. To protect the new system, Weatherford installed three 300-micron automatic self-cleaning screen filters, one before each rack of membranes. When a target pressure differential is reached or a timer triggered, filter flush valves opened to atmospheric pressure. 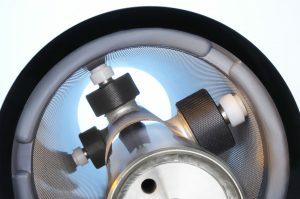 The pressure differential draws water from the clean side of the screen into suction nozzles. Filter cake is drawn into the nozzles with the water. Each nozzle focuses the back flush force onto just one square inch (6.45 square cm) of screen at a time, increasing the cleaning power and minimizing back flush water. As the nozzles scan the screen in a spiral pattern, the entire screen surface is cleaned automatically, without interrupting the filtration process. Richmond and his team of five operators have plenty to look after without worrying about maintaining filters or replacing cartridges. That’s why he likes the self-cleaning screens. “They work no matter what’s coming into them,” he says. “The screens are pretty much ‘fire and forget.’ They keep themselves clean and we’ve had to do hardly anything to maintain them.” The membranes are on a schedule for air scrubs and periodic electroflush and clean-in-place treatments, says Richmond. Having two technologies for filtration offers opportunities and challenges. Richmond points out that during periods of high turbidity in the lake’s raw water – significantly higher than the 10 NTU that the system typically handles – his team tries to direct more water to the membrane side of the T intersection, where it can be better handled. It’s important to make sure the systems don’t work together too closely. Richmond notes that the mixed-media filtration systems have check valves to prevent the membranes from pulling water – and polymers – from them. Product water from both the membrane and mixed media sides of the plant is treated with chlorine and pH-adjusted. The product water streams are recombined at a blending vault and ammonia is added to form chloramines. The water is fluoridated and collected in a one-million-gallon (3.8-million-liter) reservoir for pumping to the city. Using a combination of water treatment technologies, the City of Weatherford was able to double its water treatment capacity to keep pace with population growth, while remaining within its existing facility’s tight quarters. In addition to its compact physical footprint, the City of Weatherford’s plant has a relatively small environmental footprint. The multi-stage filtration system installed during the expansion is highly efficient, generates minimal back flush water and operates with a minimum of chemicals. The reliable, smooth-running plant has proven to be good for the city, and good for Richmond and his team. Jim Lauria is Vice President of Sales & Marketing for Amiad Filtration Systems, a manufacturer of clean technology water filtration systems for agricultural, industrial and municipal applications. He holds a Bachelor of Chemical Engineering degree from Manhattan College and has over twenty years of global experience as a senior executive in the water treatment industry. Siemens’Trident® packaged treatment system provides multiple-barrier protection for surface water, groundwater and industrial process water treatment. The system design consists of packaged, high-rate settling, adsorption clarification and mixed media filtration. Pall Aria Water Treatment systems with 0.1 micron hollow fiber Microza* microfiltration modules, are designed to comply with stringent surface water treatment regulations. The fine filters contain a mean pore size that is 1/20th the size of the smallest Cryptosporidium oocyst. Amiad’s ABS 10000 300-micron automatic self-cleaning screen filters deliver continuous, reliable filtration down to 10 microns in degree with a small environmental footprint and virtually no labor or maintenance. For more information on Amiad filtration systems, visit www.amiadusa.com. *Microza is a trademark of Asahi Kasei Corporation.